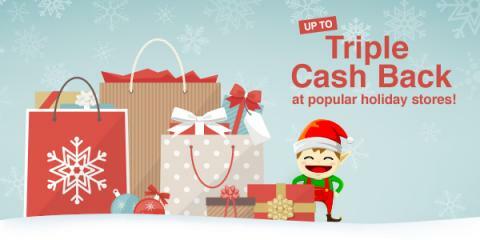 Savvy Spending: Swagbucks: up to Triple Cash Back at popular holiday stores! Swagbucks: up to Triple Cash Back at popular holiday stores! Still have lots of holiday shopping to do? I recommend you check out Swagbucks Holiday Shopping Deals, where you can get cash back on your online purchases. Who wouldn't want to earn a little extra cash for themselves on purchases for friends and family? Starting today and running through next Friday, they are offering double cash back or more at your favorite retailers like Amazon, eBay, Groupon, Gap, Macy's, Old Navy, and many more! Check out the site here to see all the deals they're offering this week. Just for signing up through me, you can earn a $3 (300 SB) bonus if you earn 300 SB before January 1st - if you spend at least $25 shopping through Swagbucks during that time, you'll get another $2 (200 SB) bonus!